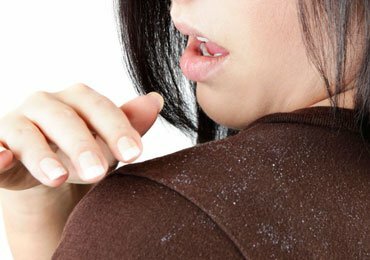 Milia are nothing but small white eruptions on the face and chest. It is either whitish or yellowish in color. It is not harmful but looks really ugly on the face and around the eyes. One of the main reason attributed towards the formation of Milia is clogged pores and inadequate exfoliation. The cyst can occur anywhere in the face and chest. They are very hard to touch. 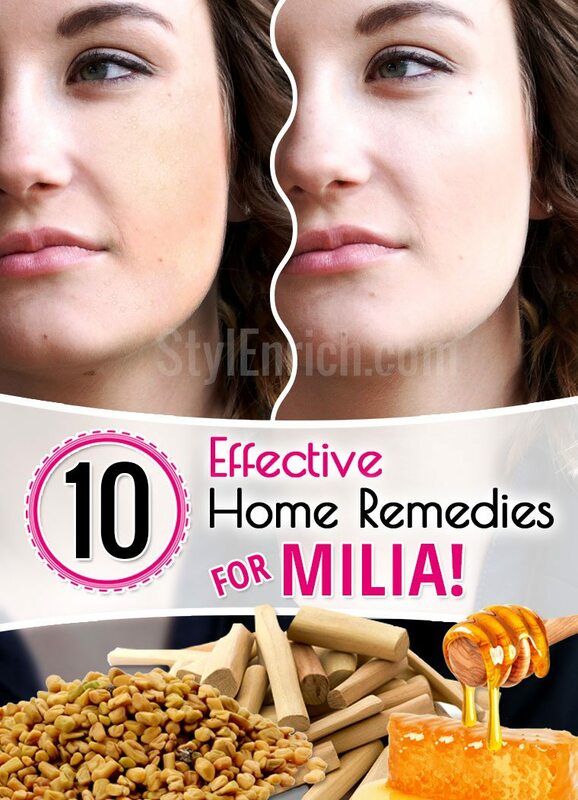 Do not worry if you are having Milia on the face or near the eyes, it can be treated effectively at home itself. 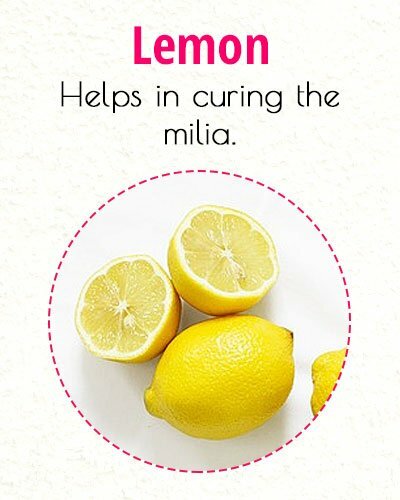 Below are some home remedies for Milia. Mix sandalwood and rose water together to form a thick paste. Apply it on the milia affected region. Wet your hands with rose water and massage in the circular direction for about 2-3 minutes. 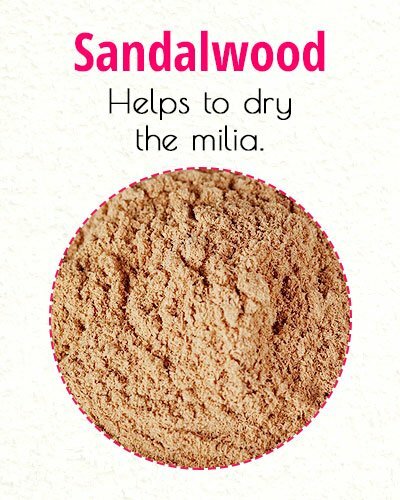 Sandalwood powder helps to dry the milia and over a period of time, these small bumps will go off. 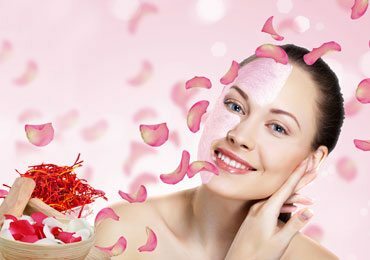 Regular usage of sandalwood and rose water is good for the treatment of milia. 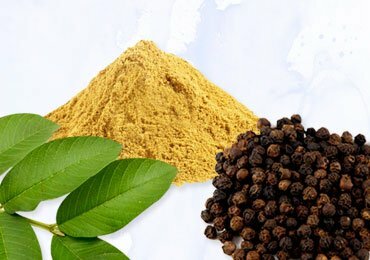 Sandalwood provides coolness to the skin and soothes the milia. 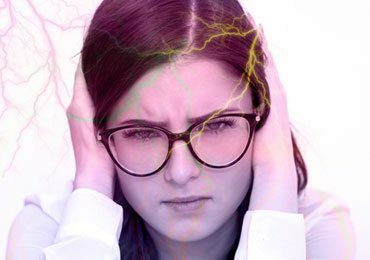 It also helps to burst the tiny bumps and discharges the toxic presence in the eruptions, thereby curing milia permanently. Extract the fresh juice of the lemon. Add granulated sugar to the fresh juice and few drops of olive oil. Apply the mix on the white bumps and massage slowly for few minutes. Wash the face and the affected regions with cold water. 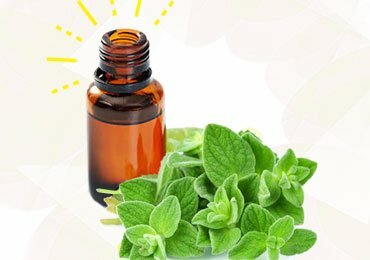 Follow this remedy 2-3 times in a week. This acts as a scrub and exfoliates the milia gently. Slowly the milia will go off. It acts as a scrubbing agent. Lemon is rich in Vitamin C and along with granulated sugar forms a rich exfoliating agent. The regular scrub will help in curing the milia. Grate 1 potato and extract the fresh juice of it. Keep the fresh juice in the refrigerator to chill it. Soak a cotton pad in the chilled potato juice. Apply the soaked cotton on the milia. Follow this method every day for best results at least 2 times in a day, once in the morning and once in the evening. Grate 1 potato and put the grated potato on the milia. Follow this method 2-3 times in a day. 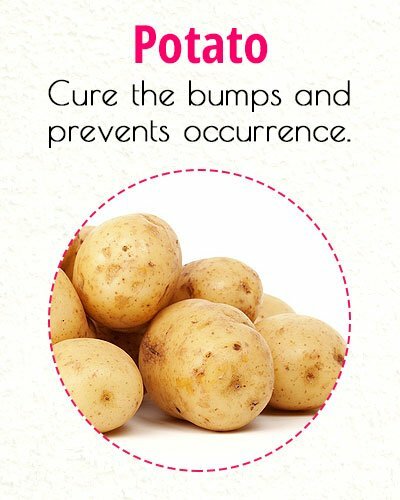 Potato is a good cleansing agent and is excellent to treat milia. Regular usage of grated potato will help in the treatment of milia. It has a high content of starch which can cure these bumps and prevent occurrence too. Peel one pomegranate and collect the skin of the pomegranate. Dry the peeled skin in sun or roast the peels till it turns golden brown. Grind the roasted peels to form the powder. Soak the roasted powder in water for the whole night. In the morning, add a small quantity of lime juice to the soaked powder. Apply the mix on the milia and allow it to dry for some time. Slightly wet your hands with normal water. Rub gently on the milia in small and circular strokes. Follow this process 1-2 times in a week for best results. 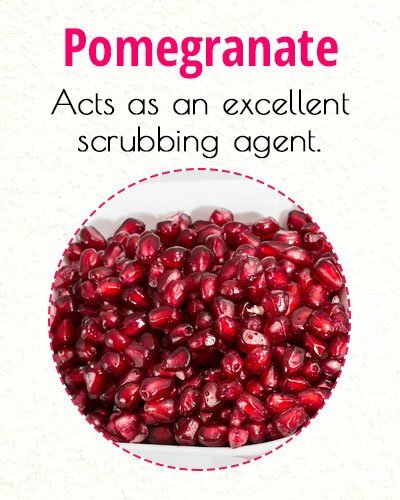 Pomegranate peels are rich in Vitamin C. They act as an excellent scrubbing agent and help to get rid of milia easily. Gentle exfoliation helps to remove the dirt accumulated in these tiny eruptions, thereby getting rid of the ugly milia. Boil water in a vessel and add few leaves to the boiling water. Let it cool down and strain the liquid. Splash the solution on the affected regions and pat dry. Grind few fenugreeks leave to form a fine paste. Apply this fine paste on the milia affected region. Allow it to remain on the milia for half an hour. Follow this process once regularly for best results. Soak fenugreek seed in a vessel for the whole night. In the morning, grind the soaked fenugreek seeds with a little quantity of water to form a thick paste. Apply the thick paste on the milia affected region. Allow it to stay for some time and rinse thoroughly with cold water. 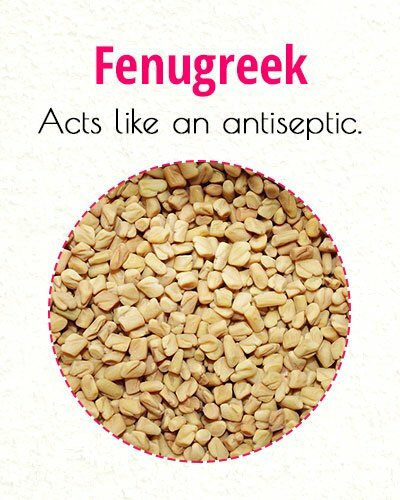 Fenugreek paste has antibacterial and cleansing properties. 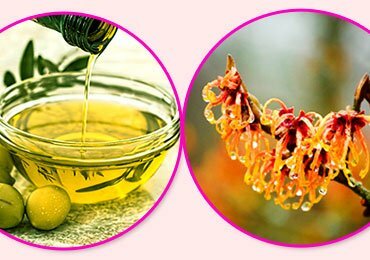 It acts as an antiseptic and is one of the good home remedies for milia. In a pressure cooker boil sufficient quantity of water. Once the cooker releases the steam, cover your head with a towel and take the steam in your face along with Milia affected regions. Continue this for 5-10 minutes. Also, rub some ice cubes all over the face to close the pores. Follow the remedy once a week for effectiveness. Squeeze the cloth to drain the excess water from it. Dab the affected portion with this cloth for few minutes. Splash cold water on the face or rub ice cubes. Follow the remedy once a week for best results. 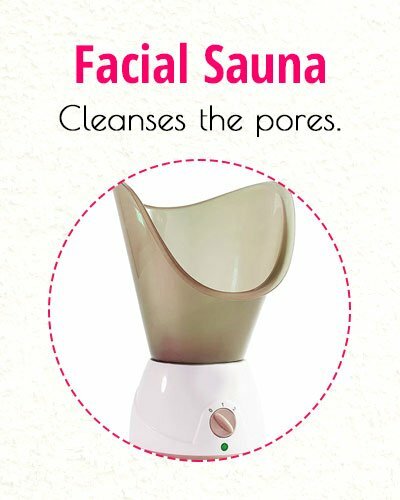 Facial sauna is very useful to cure milia as it cleanses the pores and removes the dirt and dust accumulated in the same. In other words, it cleans the clogged pores. Do not opt for the facial sauna method very frequently as it may open the pores permanently. Therefore, it is important to continuously splash cold water or run ice cubes. It will instantly close the facial pores. We bring just for you 5 absolutely stunning homemade banana face masks, for fighting against issues faced by every woman. 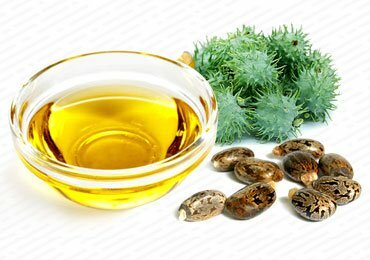 Mix equal quantities of castor oil and olive oil. Apply the oil on the affected portions of the face and chest. Allow it to stay for some time before wiping the excess oil with a clean cloth. Follow the method once a day to see a significant difference in Milia. In a bowl, add a small quantity of baking soda approximately 1-2 teaspoon. 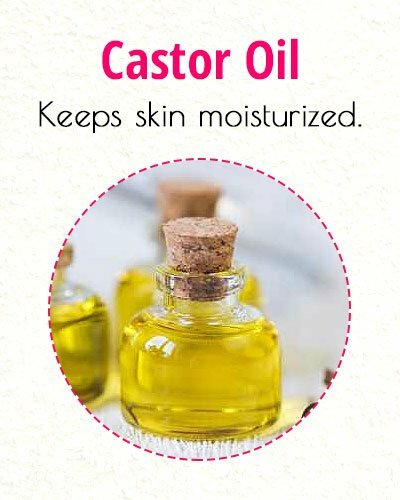 Mix half part of castor oil to one part of baking soda. Mix thoroughly and apply the mix to the affected portions of milia. Let it stay for some time approximately 15 minutes. Wash the face with cold water thoroughly to remove the ingredients. Follow the process once or twice a week for visible effects. 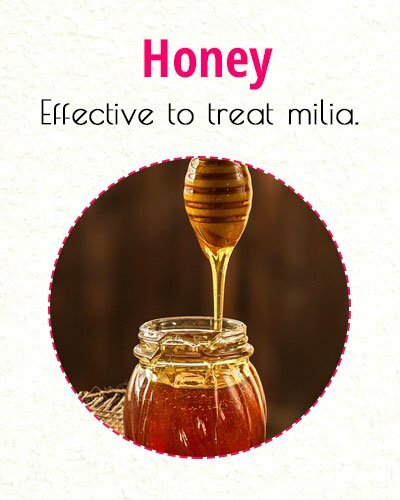 This is considered to be one of the best home remedies for milia effectively. Baking soda and castor oil work well on milia prone areas as baking soda is oil absorbent and castor oil nourishes and keeps the skin moisturized. Mix in the proportion of 1:2 both vinegar and water, i.e. 1 part of vinegar and 2 parts of water. Soak a cotton pad in this solution and dab the cotton ball on the affected portion of milia. Let it stay for some time or till the solution dries off. Wash the face and the affected portions with cold water. Follow the process once every day to see a reduction in milia. Add sufficient quantity of vinegar to cornstarch and form a smooth mix. Apply the mix to the affected portion of the milia. Boil water in a container and let it come down to room temperature. Wet a cloth in the lukewarm water and gently wipe off the ingredients. Wash your face with sufficient quantity of cold water and pat dry. Keep repeating this process regularly until you see a substantial difference in the growth of milia. Cornstarch is excellent in absorbing the oil from the milia affected areas. 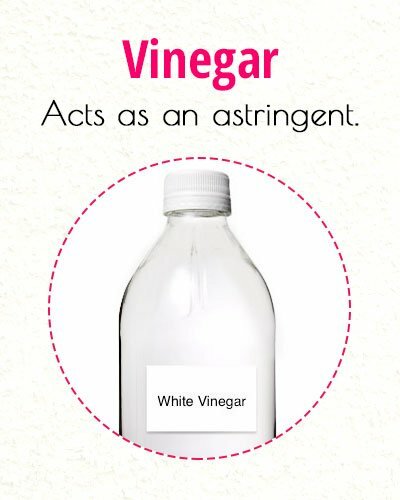 Similarly, vinegar acts as an astringent and both together work well in curing the milia effectively. One of the obvious reasons for milia is excess oil secretion in the skin. Cornstarch definitely controls the oil secretion and inhibits the formation of milia. Dilute honey with water to reduce consistency. Dab a cotton ball in this solution and apply it on the milia infected areas. Let it stay for few minutes and splash cold water to remove the ingredients. Follow this process regularly till you see a visible difference in the milia. Mix equal proportion of honey and coconut oil. Put this greasy liquid on the affected portion of milia. Let it stay for some time and wash it with normal water. Follow the process 1-2 times in a day for better results. Honey is a moisturizing agent and is very effective to treat milia. It keeps the areas nearby the bump region hydrated and prevents milia to a large extent. Look at these DIY honey face masks recipes and pamper your skin according to its type. Coconut oil makes the hard milia soft and smooth and continuous usage will result in the eradication of these hard and tiny bumps. Collect Aloe Vera gel in a glassware. Add a pinch of turmeric and few drops of olive oil and form a fine paste. 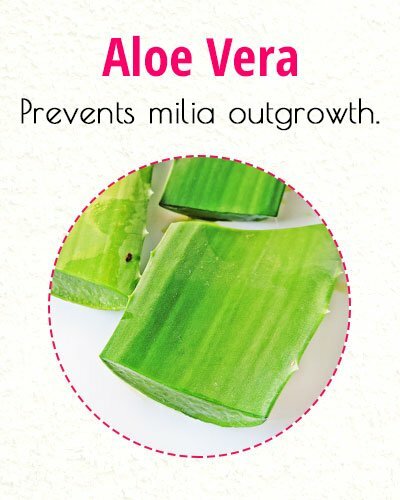 Apply the fresh Aloe gel along with the necessary ingredients and allow it to sit on the milia for some time. Wash the affected areas with cold water and pat dry. Follow the process once or twice in a week for effectiveness. Aloe Vera is excellent for the bumps and turmeric and olive oil does wonder for the skin. Turmeric acts as an antiseptic and prevents milia outgrowth as well as the bumps which have already occurred. Read more- Surprising Lemon Hacks That Will Work for You and Your Home!